The Manned Orbiting Laboratory (MOL), originally referred to as the Manned Orbital Laboratory, was part of the United States Air Force's manned spaceflight program, a successor to the cancelled Boeing X-20 Dyna-Soar military reconnaissance space plane project. The project was developed from several early Air Force and NASA concepts of manned space stations to be used for reconnaissance purposes. MOL evolved into a single-use laboratory, with which crews would be launched on 40-day missions and return to Earth using a Gemini B spacecraft, derived from NASA's Project Gemini. The MOL program was announced to the public on 10 December 1963 as a manned platform to prove the utility of man in space for military missions. Astronauts selected for the program were later told of the reconnaissance mission for the program. The contractor for the MOL was the Douglas Aircraft Company. The Gemini B was externally similar to NASA's Gemini spacecraft, although it underwent several modifications, including the addition of a circular hatch through the heat shield, which allowed passage between the spacecraft and the laboratory. MOL was cancelled in 1969, during the height of the Apollo program, when it was shown that unmanned reconnaissance satellites could achieve the same objectives much more cost-effectively. U.S. space station development was instead pursued with the civilian NASA Skylab (Apollo Applications Program) which flew in the mid-1970s. In the 1970s, the Soviet Union launched three Almaz military space stations, similar in intent to the MOL, but cancelled the program in 1977 for the same reasons. The MOL was planned to use a helium-oxygen atmosphere. It used a Gemini B spacecraft as a reentry vehicle. The crew were to be launched using a Titan 3M with the stacked Gemini B and MOL, and returned to Earth in the Gemini B. They would conduct up to 40 days of military reconnaissance using large optics, cameras, and side-looking radar. The USAF Astronaut Maneuvering Unit (AMU) was developed for the MOL project. NASA chief astronaut Deke Slayton later speculated in his autobiography that the AMU may have been developed for MOL because the Air Force "thought they might have the chance to inspect somebody else's satellites." In response to the announcement of the MOL, the Soviet Union commissioned the development of its own military space station, Almaz. Three Almaz space stations flew as Salyut space stations, and the program also developed a military add-on used on Salyut 6 and Salyut 7. The Gemini capsule was redesigned for MOL and named Gemini B. Externally it was similar to Gemini, but featured a rear hatch for the crew to enter MOL and many specific systems. Gemini B would be launched with the MOL space station. Once in orbit, the crew would power down the capsule and activate MOL. After about one month of space station operations, the crew would return to the Gemini B capsule, separate from the station and perform reentry. Gemini B had an autonomy of about 14 hours once detached from MOL. Top row L-R: Herres, Hartsfield, Overmyer, Fullerton, Crippen, Peterson, Bobko, Abrahamson. Bottom Row L-R: Finley, Lawyer, Taylor, Crews, Neubeck, Truly. Operational MOLs were to be launched on Titan IIIM rockets from Vandenberg AFB SLC-6 and Cape Canaveral AFS LC-40. 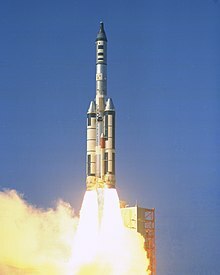 Test flight OPS 0855 for MOL was launched on 3 November 1966 at 13:50:42 UTC on a Titan IIIC-9 from Cape Canaveral Launch Complex 40. The flight consisted of a MOL mockup built from a Titan II propellant tank, and the refurbished capsule from the Gemini 2 mission as a prototype Gemini B spacecraft. After the Gemini B prototype separated for a sub-orbital reentry, the MOL mockup continued into orbit and released three satellites. A hatch installed in the Gemini's heat shield—intended to provide access to the MOL during manned operations—was tested during the capsule's reentry. The Gemini capsule was recovered near Ascension Island in the South Atlantic by the USS La Salle after a flight of 33 minutes. The Gemini no.2 capsule used in the only flight of the MOL program is on display at the Air Force Space & Missile Museum at Cape Canaveral Air Force Station. A test article at the National Museum of the United States Air Force, Wright-Patterson AFB, Ohio, is the Gemini B spacecraft (sometimes confused with Blue Gemini). It is recognized by its distinctive "US Air Force" written on the side, and the circular hatch cut through the heat shield. Starting in 1965 a large optical system was added to the spacecraft for military reconnaissance. This camera system was codenamed Dorian and given the designation KH-10. The project was canceled on 10 June 1969 before any operational flights occurred. The KH-10 intended for the MOL program was succeeded by the unmanned KH-11 Kennan, which launched in 1976 as the Soviet Union was winding down its manned space reconnaissance program. The KH-11 is said to have achieved the goal of 3-inch (76 mm) imaging resolution and introduced video transmission of images back to Earth. The program was canceled on 10 June 1969 with the first projected flight three years away. Between 1965 and 1969, MOL's projected cost rose from $1.5 billion to $3 billion while the Vietnam War took larger portions of the defense budget. While Defense Secretary Melvin R. Laird and the Joint Chiefs of Staff strongly supported the station, Central Intelligence Agency head Richard Helms did not support the project because he feared that the death of a MOL astronaut might ground launches and thus damage the nation's satellite reconnaissance program. President Richard Nixon and National Security Advisor Henry Kissinger agreed to the Bureau of the Budget's proposal to cancel MOL, as it was determined the capabilities of unmanned spy satellites met or exceeded the capabilities of manned MOL missions. NASA offered those under 35 years of age the opportunity to transfer to its astronaut program. Seven of the 14 MOL astronauts were younger than 35 and took the offer, becoming NASA Astronaut Group 7: future NASA Administrator Richard H. Truly, Karol J. Bobko, Robert Crippen, C. Gordon Fullerton, Henry W. Hartsfield, Robert F. Overmyer, and Donald H. Peterson. All flew on the Space Shuttle. In 2005, two MH-7 training space suits from the MOL program were discovered in a locked room in the Launch Complex 5/6 museum on Cape Canaveral. In July 2015, the National Reconnaissance Office declassified over 800 files and photos related to the Manned Orbiting Laboratory program. In the 2016 novel Blue Darker Than Black by Mike Jenne, the MOL program is secretly transferred from the Air Force to the United States Navy after its official cancellation in 1969. The Navy launches an ocean surveillance MOL in July 1972. Two Air Force Blue Gemini astronauts fly a rescue mission to the MOL after its crew is incapacitated by the August 4, 1972 solar storm. ^ "Air Force to Develop Manned Orbiting Laboratory" (PDF) (Press release). Department of Defence. 10 December 1963. ^ a b "NOVA: Astrospies". PBS. Retrieved 13 October 2011. ^ Slayton & Cassutt 1994, p. 249. ^ Slayton & Cassutt 1994, p. 174. ^ "The Almaz program". Russian Space Web. Archived from the original on 14 May 2011. Retrieved 12 February 2011. ^ Wade, Mark. "Almaz". Encyclopedia Astronautica. Archived from the original on 19 November 2010. Retrieved 12 February 2011. ^ Grahn, Sven. "The Almaz Space Station Program". Sven's Space Place. Retrieved 12 February 2011. ^ "Gemini B RM". Astronautix.com. ^ "Gemini Capsule". Air Force Space & Missile Museum. Retrieved 17 June 2014. ^ "Gemini Spacecraft". National Museum of the US Air Force. 7 March 2007. Archived from the original on 2 March 2015. Retrieved 12 February 2011. ^ Heppenheimer, T. A. (1998). The Space Shuttle Decision. NASA. pp. 204–205. OCLC 40305626. SP-4221. ^ Nutter, Ashley (2 June 2005). "Suits for Space Spies". NASA.gov. Retrieved 12 February 2011. ^ "Index, Declassified Manned Orbiting Laboratory (MOL) Records". National Reconnaissance Office. Retrieved 16 December 2018. ^ Jenne, Mike (2016). Blue Darker Than Black. Yucca Publishing. ISBN 978-1-63158-066-6. Slayton, Donald K. "Deke"; Cassutt, Michael (1994). Deke! U.S. Manned Space: From Mercury to the Shuttle (1st ed.). New York: Forge. p. 249. ISBN 0-312-85503-6. LCCN 94002463. OCLC 29845663. Wikimedia Commons has media related to Manned Orbiting Laboratory. Winfrey, David (16 November 2015). "The last spacemen: MOL and what might have been". The Space Review.